AMERICAN INDIANS: STEREOTYPES & REALITIES by Devon A. Mihesuah (Clarity Press, 1997). Valuable overview—deconstructs and re-educates, especially recommended to teachers, but also a good fit for young adults. Ages 12-up. AMERICAN INDIAN STEREOTYPES IN THE WORLD OF CHILDREN: A READER AND BIBLIOGRAPHY by Arlene Hirschfelder, Paulette Fairbanks Molin (Minnesota Chippewa Tribe from the White Earth Reservation), and Yvonne Wakim (Cherokee) (Scarecrow, 1999). Notably Chapter 5 is Reading is Fundamental for Truths or Stereotypes. Look for the latest edition. 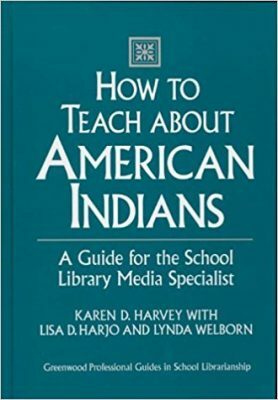 HOW TO TEACH ABOUT AMERICAN INDIANS: A GUIDE FOR THE SCHOOL LIBRARY MEDIA SPECIALIST by Karen D. Harvey, Lisa D. Harjo (Choctaw) and Lynda Welborn (Greenwood, 1995). Recommended to both school librarians and teachers. NATIVE AMERICA IN THE TWENTIETH CENTURY: AN ENCYCLOPEDIA edited by Mary B. Davis with assistant editors Joan Berman, Mary E. Graham, and Lisa A. Mitten (Mohawk) (Garland, 1994). A vast collection of articles, forty percent of which are by Native people, address a variety of topics such as BIA schools, art, health, individual Native Nations, supplemented by bibliographies, maps, and photographs. 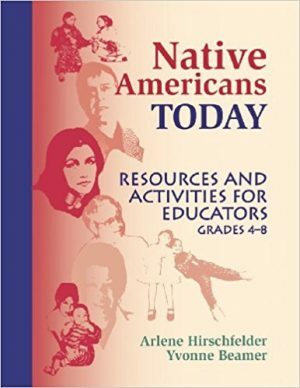 NATIVE AMERICANS TODAY: RESOURCES AND ACTIVITIES FOR EDUCATORS GRADES 4-8 by Arlene Hirschfelder and Yvonne Beamer Wakim (Cherokee) (Libraries Unlimited, 2000). Wakim has worked in Indian education and community services for more than 25 years. Hirschfelder has written numerous non-fiction books on Native people and has worked for the Association on American Indian Affairs for more than 20 years. RED ON RED: NATIVE AMERICAN LITERARY SEPARATISM by Craig S. Wormack (Muscogee (Creek)-Cherokee). A fascinating examination of the way in which Native literature should be evaluated–on its own terms with the understanding that it is not a branch on the tree of mainstream literature but rather a tree unto itself (to paraphrase the author). Unfortunately, there wasn’t space for the author to consider Native children’s literature, which has its own (younger) primary audience and criteria, but we recommend the title with that caveat. 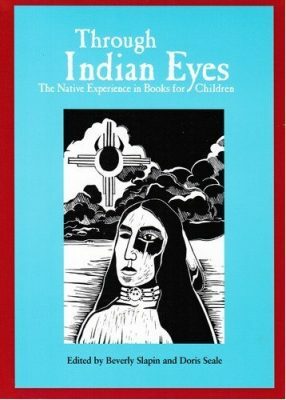 THROUGH INDIAN EYES: THE NATIVE EXPERIENCE IN BOOKS FOR CHILDREN edited by Beverly Slapin and Doris Seale (Santee Cree) (American Indian Studies Center, 1998). This book is worth buying for the poems, art, and essays alone. By reading all of the reviews, one can extrapolate an approach to employ in evaluating other books and in considering this area of children’s literature as a whole.Look for the fourth edition. ISBN 0-935626-46-8. It may be ordered from Oyate or from the American Indian Studies Center, UCLA, 3220 Campbell Hall, Los Angeles, CA 90095-1548; (310) 206-7508; (310) 206-7060 fax. The Cradleboard Teaching Project: provides Native curriculum to tribal and mainstream schools; founded by Buffy Sainte-Marie (Cree). Journal of American Indian Education: “The Journal of American Indian Education is a peer reviewed scholarly journal, which publishes papers specifically related to the education of American Indians and Alaska Natives.” It is published three times annually by the Center for Indian Education at Arizona State University’s College of Education. Full text of past volumes is online, includes search engine and subscription information. Native American Education Links from Dr. Jon Allan Reyhner at Northern Arizona University. Resources for Tribal Libraries by Elaine Cubbins at the University of Arizona. Critical Bibliography on North American Indians for K-12 from the Anthropology Outreach Office at the Smithsonian Institution. American Indian Newspapers and Magazines: list of links to tribal newspapers, Indian Country Today, and the Native American Journalist’s Association from The Seminole Tribe of Florida. Native America Calling: The National Electric Talking Circle: a project of Koahnic Broadcast Corporation (think radio interviews, NPR). 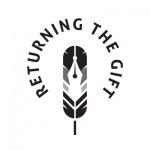 The American Indian College Fund: non-profit organization that raises scholarship, endowment, and operating monies for Native American tribal colleges. Native American Rights Fund “Standing Firm for Justice”: the premier legal advocacy organization. Oyate: evaluates educational resources and fiction by and about Native people, leads workshops for teachers, and distributes excellent examples of such materials, making an effort to highlight Native authors and illustrators. Talk Story: Sharing Stories, Sharing Culture: a joint project of the American Indian Library Association and the Asian/Pacific American Librarians Association. American Indian Library Association’s Children’s and MG-YA Booklists. 2018 Summer Middle Grade & YA Book List by Naomi Bishop from the American Indian Library Association. CYN NOTE: Deeply honored to see HEARTS UNBROKEN on this list. “A Different Drum: Native American Writing” by Cynthia Leitich Smith, “Field Notes,” (The Horn Book Magazine, July 2002)(p.407). A discussion of the value of vulnerability of Native American writing styles in the mainstream market. Four Native YA Authors on Their Message for Teens by Alia Jones from School Library Journal. CYN NOTE: Interview features Joseph Bruchac, Eric Gansworth, Dawn Quigley and Cynthia Leitich Smith. Article is free, but requires email registration to view. Honoring Alaska’s Indigenous Literature from Alaska Native Knowledge Network at the University of Alaska Fairbanks. 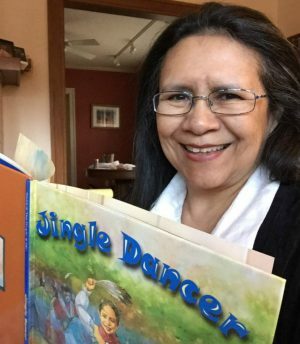 Indigenous #Kidlitwomen by Debbie Reese from American Indians in Children’s Literature. Frequently Asked Questions about American Indians from the Native American Rights Fund. “Mom, Look! It’s George, and He’s a TV Indian!” by Debbie Reese (Pueblo), September/October 1998, Horn Book (pgs. 636-643). See also “We are Still Here”: An Interview with Debbie Reese from the National Council of Teachers of English (2016). Native Voices: Sharing Stories and Talking Back from We Need Diverse Books. PEEK: “I’m hopeful—in part because of voices like those I’m welcoming to this circle today, in part because I’ve seen Native and non-Indian children embrace contemporary Native characters and historical ones who’re depicted as three-dimensional human beings.” SEE ALSO Part 2. Selective Bibliography and Guide for “I” is not for Indian: The Portrayal of Native Americans in Books for Young People: compiled by Naomi Caldwell-Wood and Lisa A. Mitten; published in conjunction with a program of the ALA/OLOS Subcommittee for Library Services to American Indian People/American Indian Library Association in 1991. Techniques for Evaluating American Indian Web Sites by Elaine Cubbins at the University of Arizona.